Where do our rights come from, God or man? 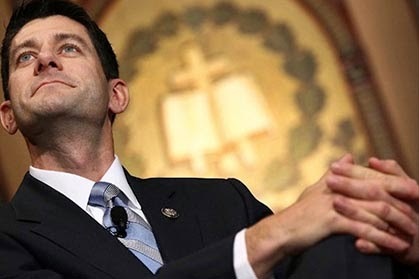 Paul Ryan said "Our rights come from nature and God, not from government". Where do our rights come from - God or man? For progressives, this can be a tedious question, because the answer seems so self-evident, which makes it hardly worthy of investigation. But to conservatives in the United States it's one of the most compelling questions of the age. He was exactly wrong, of course. Neither God nor Mother Nature wrote the Declaration of Independence or the U.S. Constitution. But Ryan didn't care because his platitude was crafted to play strongly to the 'Godless liberals are destroying America' people (and there are millions of them being daily stoked by this toxic nonsense). Instead, they believed, our rights come from the social compact, from our general and shared sense of what is fair and just. But conservatives want our rights to come from God so that they can restrict them to the people most deserving of God's favor: themselves. They want our rights to come from God so they can overlook the fact that we live in a secular democracy, rather than a Christian theocracy. If you have rights, they say, it's because God gave them to you. If you don't have rights, they say, it's because God disfavored you, and He always will, so you're permanently out of luck. Forget women's rights and gay rights and equal rights generally. Obamacare is just one battle in a larger ongoing war. A war to turn the clock back past the Enlightenment. Twenty years from now people will probably remember two things about this week: that the Affordable Care Act survived every GOP attempt to prevent it from becoming law - and that a court stenographer had a scary meltdown about the freemasons the night the last attempted folded. It's not surprising that some citizens are now hearing voices as whacked out as the ones on the radio and the cable news networks. The conservative entertainment complex, in full meltdown mode itself, has been stoking the fires of civil and religious hostility for over a decade. That’s why on Wednesday, as the vote to reopen the government was winding down, when a court stenographer later identified as Dianne Reidy walked up to the podium and started shouting, panic ensued. One nation, two masters. It’s either God's law or man's law. It can't be both, she said. The insanity of bringing the nation to the edge of a catastrophic default found a fitting coda in the insane rantings of a previously very dependable clerk. Reidy's protest was unhinged but it contained a version of that dangerous 'rights come from God not man' conflation, an idea that presupposes that that God is on the GOP's side, and that in contrast the president is motivated by socialism, Islamism and racism. I don't know what Bible other people have been reading, but the one I have contains numerous passages that insist we are our brother's keeper, that we must welcome the stranger, we must feed the hungry, clothe the naked, and heal the sick. Those are pretty clear cut charges. What we just witnessed, however, was an epic attempt by the GOP to prevent millions of poor people from seeing a doctor. So the Republicans results don't line up with the Christian rhetoric. Rights, for the GOP, are only rights if they're approved by God and the Republican party platform. But that's the surest sign that you've made your God in your own image.